As De Mee in action at Kelso (picture by Alan Raeburn). A huge number of entries have been received for Kelso’s Hallowe’en Fixture this coming Saturday, October 27. 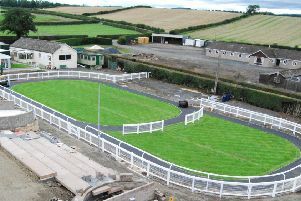 Recent rain and autumnal weather has helped racehorse trainers to hone the fitness of the horses in their charge, while the ground at Kelso is officially described as ‘good’. Grand National hero One For Arthur was a winner on this programme two years ago and the races staged at this October fixture frequently attract horses that go on to win major races later in the season. Last year’s programme featured the Paul Nicholls-trained As De Mee, owned by Dame Judi Dench – a previous winner over Aintree’s Grand National fences. The Lucinda Russell-trained Big River won the novice chase on the programme and could be destined for Aintree glory himself – so the races are well worth watching and the winners noting. This year, Lucinda Russell relies upon Arizona Bound in the Clifford & Martin Firth Memorial Novice’s Chase – already a winner over fences who carries the colours of Kelso Lowflyers syndicate, a group of annual members of the racecourse – as well as Chanceiton owned by her father, Peter. An interesting raider, and chasing debutante from the south, could be Mahler’s First from the Devon yard of Victor Dartnall. 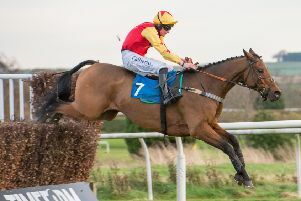 The Ian Anderson Memorial Maiden Hurdle Race divided into two races last season and Rose Dobbin, who landed the second division with Some Reign, bids for more success with Definite Wisdom and The Hollow Chap. Inverurie-based Jackie Stephen is Britain’s most northerly trainer and she is double-handed with Captain Kurt and Starozov. All the top stables are represented in the feature race of the day, the three-mile EDF Handicap Steeplechase, including Jonjo O’Neill, Nigel Twiston-Davies, Kim Bailey, David Pipe, Donald McCain and Nicky Richards. The highest rated horse on parade is Fergal O’Brien-trained Perfect Candidate, an early casualty in last season’s Grand National, who has a BHA mark of 152. Michael Scudamore’s Mysteree was the winner of the 2017 Eider Chase at Newcastle, while Tom Lacey-trained Thomas Partick was successful in Grade 3 company at Aintree last April. Civil Unrest and Ailizee De Janeiro, second and third in the Sir Maxwell Harper Gow Handicap Hurdle Race, are among the massive 28 entries for the 2018 renewal. Dual Kelso bumper winner Tokaramore, bred in Berwickshire by Ailie Tullie, puts her unbeaten course record on the line as she samples her first taste of a handicap hurdle. Nick Alexander has his three-time course winner Benny’s Secret entered, along with stablemate Jet Master, for the Carnacrack Handicap Hurdle at 4.40pm. Irish trainer John McConnell, who saddled a double at Kelso’s opening meeting of the autumn, has pencilled in his two-time winning hurdler Roi De Dubai. Ascot De Bruyere, trained by James Ewart, was the horse that supplied now-retired Brian Harding with his final winner when successful at Kelso in March 2017. He’s an entry in the final race of the day at 5.15pm. Wyfield Rose, owned by borders-based John and Liz Elliot and trained by Dianne Sayer, has already scored this autumn when making all at Sedgefield early last month. Irish singer-songwriter, Craig McMorrow, a competitor on The Voice Ireland in 2014, will be providing the post-racing entertainment in the pavilion marquee followed by a DJ. The gates open at noon and the first race is due off at 1.50pm.